With the eventual wave to tax season goodbye … oh wait … We need to remind you of ANOTHER form that will be coming soon. NOPE, not a worry. This form settles up your contributions, rollovers and values for your Qualified Assets ….. think IRA, SEP or 401k Rollover and the like. It rolls in after tax season as it reports contributions for the current year to the IRS and they settle up the matching on their side for the appropriate year. Yet another neat thing the IRS does for us. As a courtesy for clients and as a more GREEN Internal Policy we accept all Proxies for clients and vote. One Proxy statement which may be delivered to us electronically can handle literally hundreds of clients at once, saving the company a headache and lessening the duplication cost and waste. Companies occasionally lose the directive to send us the material …. new recordkeeping, merging with another company or the like, are reasons, but no matter – If you are receiving proxy material please let us know and we will have information at the delivering company update their records, saving time and waste. Looks to be a wonderful weekend here in the south … enjoy yours wherever you may be and …. Talk to you next week! 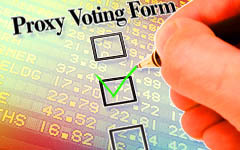 Proxy Vote – We vote your proxies for you. As we enter the season of the Proxy, we want to re-iterate if you are receiving proxy material, let us know as we vote your proxy material in bulk as a courtesy for you and the respective proxy company. The proxy machine is about to rev up, so watch out and let us know promptly if you are receiving them directly. A special hat tip to Ed Kvale, my dad, who just called with one in his hand…sorry about that dad, thanks dad..we have you covered! Address changes and any other account related items…We have them covered. Fortunately we have a team of 8 people (formal name Team 16..sometimes named saviours from our standpoint…haha) dedicated to our firm for service requests. They are awesome, just terrific, and know our needs on a constant basis. If you have any account related change, let us know and we can have it completed in fast and efficient time. You are always free to call directly, but if you do your call will not be routed to our team members and may be delayed. Never hesitate to pick up the phone or hit send on that email to us….We have you covered, that’s our job!